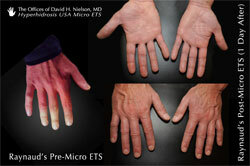 Raynaud's Micro ETS Treatment Hands Make Hands Warm. Watch Video - How Raynaud's Symptoms Can Be Improved? Episodic vasospasm (constriction of small arteries) of the fingers or toes. It is characterized by digital (fingers or toes) blanching or white color, cyanosis (blue), a feeling of numbness or dulled sensory response and rubor (red) after cold exposure and rewarming. It can also be induced by anxiety or stress. This condition is primarily confined to the fingers and toes but can affect areas of the body such as your nose, cheeks, ears and even tongue. Primary Raynaud's phenomenon is also called Raynaud's disease. Criteria for Raynaud's disease include episodic digital ischemia (sequence of color changes in the skin in response to cold or stress), a numb, prickly feeling of the fingers, or stinging pain upon warming or relief of stress, absence of arterial occlusion, bilateral distribution, absence of symptoms or signs of other diseases that also cause Raynaud's phenomenon, and duration of symptoms for 2 years or longer. Most people with Raynaud's Disease develop symptoms before they reach 40 years of age. It can occur in young children. Raynaud's Disease affects women three to five times more frequently than men. The prevalence is lower in warm climates than in cold climates. Before - Severe Raynaud's Unresolved with Meds. After - Micro ETS Surgery - Symptoms Immediately Resolved. The mechanisms postulated to cause Raynaud's phenomenon include increased sympathetic nervous system activity, heightened digital vascular reactivity to vasoconstrictive stimuli, circulating vasoactive hormones, and decreased intravascular pressure. The sympathetic nervous system mediates the digital vasoconstrictive response to cold exposure and emotional stress but has been discounted as a primary mechanism. Some investigators have suggested that increased sensitivity, increased numbers of postsynaptic alpha2-adrenergic receptors, or both enhance the vasoconstrictive reactivity to sympathetic stimulation. Blanching represents the ischemic (lack of adequate blood flow) phase of the phenomenon, caused by digital artery vasospasm. Cyanosis results from deoxygenated blood in capillaries and venules (small veins). Hyperemic phase, upon rewarming and resolution of the digital vasospasm, the digits appear red. Raynaud's can be a primary or secondary disorder. In some cases of Raynaud's phenomenon, endogenous vasoactive substances (e.g., angiotensin II, serotonin, and thromboxane A2) and exogenous vasoconstrictors (e.g., ergot alkaloids and sympathomimetic drugs) may cause digital vasospasm. Many patients with Raynaud's phenomenon have hyperhidrosis (sweaty palms). Temperatures of the fingers or toes can be measured as low as 70 degress Fahrenheit. Noninvasive vascular tests that are occasionally used to evaluate patients with Raynaud's disease include digital pulse volume recordings and measurement of digital systolic blood pressure and digital blood flow. Nailfold capillary microscopy is normal in patients with Raynaud's disease, whereas deformed capillary loops and avascular areas are present inpatients with connective tissue disorders or other causes of digital vascular occlusion. Determinations of the erythrocyte sedimentation rate and titers of antinuclear antibody, rheumatoid factor, cryoglobulins, and cold agglutins are useful to exclude specific secondary causes of Raynaud's phenomenon. Angiography is not necessary to diagnose Raynaud's phenomenon but may be indicated in patients with persistent digital ischemia secondary to atherosclerosis, thromboembolism, or thromboangiitis obliterans to identify a cause that may be treated effectively with a revascularization procedure. Past medical history is most important in making the diagnosis of Raynaud's disorder. Raynaud's phenomenon should be distinguished from acrocyanosis, a condition in which there is persistent bluish discoloration of the hands or feet. Like Raynaud's phenomenon, cyanotic discoloration intensifies during cold exposure, and rubor may appear with rewarming. Acrocyanosis affects both men and women, and the age at onset is usually between 20 and 45 years. The prognosis of patients with idiopathic acrocyanosis is good, and loss of digital tissue is uncommon. Patients should avoid cold exposure and dress warmly. Pharmacologic intervention usually is not necessary. Alpha-adrenergic blocking agents and calcium channel blockers may be effective in some patients with acrocyanosis. Severe Finger Pain Immediately Resolved with Warming, Excellent Pink Skin Color. Patients with Raynaud's phenomenon should avoid unnecessary cold exposure and wear warm clothing. In addition to the hands and feet, the trunk and head should be kept warm to avoid reflex vasoconstriction. Clinical Results - Patient's Fingers Saved (Patient Story) Pharmacologic intervention is indicated in patients who do not respond satisfactorily to conservative measures. Calcium channel blockers, such as nifedipine, and sympathetic nervous system inhibitors, such as prazosin and its longer-acting analogues, can be used to treat Raynaud's in some individuals. Oral vasodilator prostaglandins are currently under investigation.Surgical sympathectomy up until recently, has rarely been advocated due to the extreme invasiveness of most surgeon's techniques. Today, patients afflicted with Raynaud's disorder have available to them a revolutionary approach to treat their affliction. Dr. David H. Nielson offers patients a minimally invasive technique he calls "Micro Single Incision ETS" (endoscopic thoracic sympathectomy) through a single 1/12th inch axillary incision. This affords patients with Raynaud's a much less invasive approach in treating their disorder. 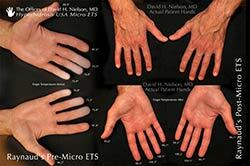 Upon completion of bilateral Micro ETS of T2 and T3, patients awaken in the operating room with warm and dry fingers and hands. * information gathered in part from "1998, Scientific American Inc."